In THE BOY, Tami Hoag - the Sunday Times bestselling author - returns to the world of her bestselling title A THIN DARK LINE and explores every mother's worst nightmare. 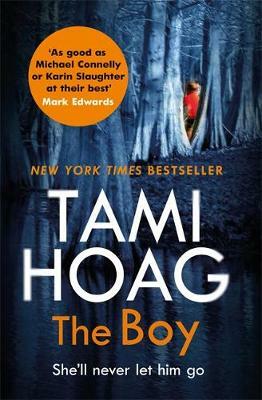 In THE BOY, Tami Hoag - the Sunday Times bestselling author of A THIN DARK LINE - returns with a breathtaking standalone thriller. A mother runs to her neighbor - bloody and hysterical - an intruder has attacked her son. When the police arrive, they find no evidence of a break-in. Twenty four hours later a teenage girl disappears. 'Tami Hoag at her down and dirty best' TESS GERRITSEN. In the sleepy Lousiana town of Bayou Breaux, the police arrive to find Genevieve Gauthier cradling her seven-year-old son in her arms as he bleeds to death. The scene is chaotic, but as Detective Nick Fourcade moves through the house, he sees no evidence of a robbery. Detective Annie Broussard sits with Genevieve, trying to make sense of her story. A mother herself, Annie understands the emotional devastation this woman is going through, but as a detective she's troubled by parts of Gauthier's story that make no sense. The next day, thirteen-year-old Nora Florette is reported missing. It is unclear if Nora has run away or if her disappearance is something more sinister. The town is up in arms, with parents fearing a maniac is preying on the children of Bayou Breaux, and wondering what the police are going to do about it. As Fourcade and Broussard dig into their case, they find something shocking about Genevieve Gauthier's past. She is both victim and the accused; a grieving mother and a woman with a deadly secret. Could she have something to do with the disappearance of Nora Florette? Is the key to these dark mysteries THE BOY? Tami Hoag is the #1 international bestselling author of more than thirty books published in more than thirty languages worldwide. Renowned for combining thrilling plots with character-driven psychological suspense, Hoag first hit the New York Times Bestseller list with NIGHT SINS, and each of her books since has been a bestseller. She leads a double life in Palm Beach County, Florida where she is also known as a top competitive equestrian in the Olympic discipline of dressage. Find out more at www.tamihoag.com or follow her on twitter @TamiHoag.